Introducing Our New Elect '16 Channel | SmartNews, Inc.
Before joining SmartNews, I spent more than 20 years as a political reporter and editor, most of them in Washington. And one of the things that perennially both fascinated and appalled me was how early presidential campaigns began. Particularly since most voters never seemed to actually tune into the campaign until the summer nominating conventions — and sometimes not until well after Labor Day. This time is different. The Donald Trump phenomenon, combined with the absence of an incumbent seeking re-election, has seized public attention extraordinarily early, and threatens to hold it tight for the next 10 months. So today, we’re rolling out a new channel in SmartNews — Elect ’16 — to give you the fastest, best and most comprehensive way to keep up with this already-remarkable campaign. 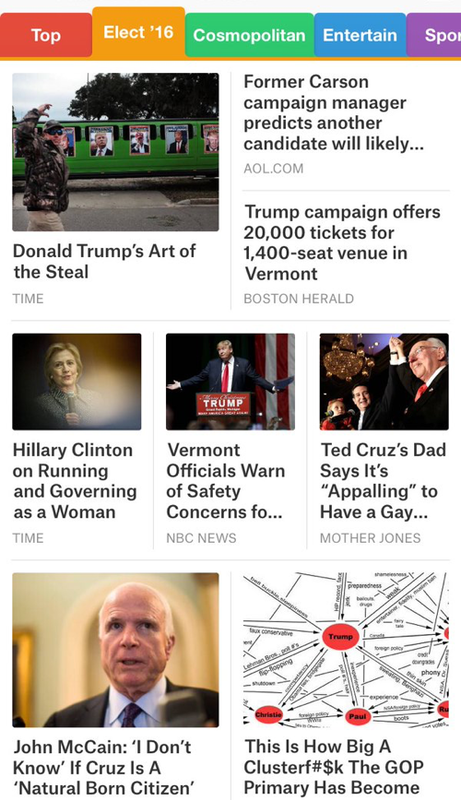 SmartNews is algorithmically driven — which is to say, there aren’t human editors selecting what news goes into the app. (And to all you conservatives who complain we’re too liberal, and all you liberals who complain we’re too conservative: The algorithm is optimized for diversity of voices; we think there’s value in hearing what people you disagree with are saying.) Our system scours the web looking for the most important, most shared and highest-quality stories, then evaluates and categorizes them, weeding out duplicates, before delivering them to you. This isn’t a trivial feat to begin with, and it becomes even harder when it comes to deciding whether a story with political overtones belongs in the Elect ’16 Channel or somewhere else. Does a story about the investigations into New Jersey Gov. Chris Christie and the mysterious 2013 closing of the George Washington Bridge belong in the election channel, since he’s a presidential candidate, or in U.S. News, since it isn’t strictly speaking about his campaign? Does a piece about Democratic frontrunner Hillary Clinton and Benghazi belong in World News, or Elect ’16? The true answer to such questions is probably, “It depends,” and as the campaign goes along, the SmartNews app will get smarter and smarter about making such decisions. That’s how machine-learning algorithms work. 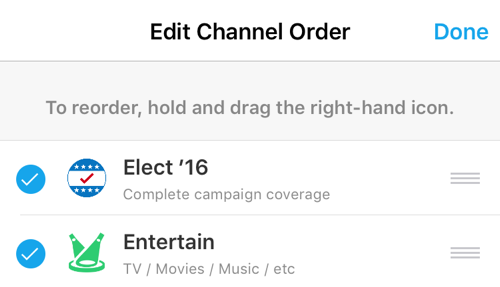 All U.S. users will get the Elect ’16 Channel automatically. But what if you want to move it to a different spot, or (we hope not!) get rid of it entirely? It’s easy. Simply press and hold any of the colored channel tabs to bring up the Edit Channel Order screen. Tap and hold the triple-bar icon to the right and drag the channel to whichever position you want it to occupy. To delete a channel, simply uncheck the blue button to its left. Tap Done, and you’re finished. We hope you find the Elect ’16 Channel useful, informative and, dare we say it, fun. As always, we’d love to hear your feedback via Settings > Support within the SmartNews app, via email at support@smartnews.com, or @smartnews on Twitter.